Alannah Robins. Space Invaders. Bronze. The work of contemporary Irish artist Alannah Robins, based in Connemara, revolves around themes of identity, memory, migration and man’s relationship to nature. Her five meter tall wooden sculpture Woman of the Water, still intact after 20 years in Cumbria Sculpture Park, is ranked by The Guardian as one of the top eight sculptures of the female figure in England. 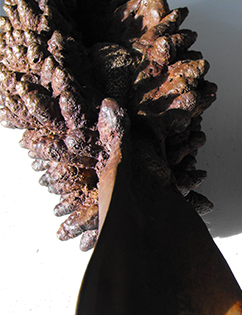 Galleri Duerr presents Alannah Robins works in bronze. Crimean / Åland photographer Natalia Mikkola´s work blurs the boundaries between the real and the imagined. Rather than pure documentation, Natalia strives to convey a specific feeling, atmosphere. Her large format Fine Art chromogenic prints are mounted on plexiglas ®Diasec, produced by a renowned lab in Dusseldorf. Natalia Mikkola’s work has already been acquired by well-known collectors throughout Europe.